I'm sure it's different then it would be if I found a snail in one of my tanks. I see Steve is still the #1 snail fan on CA. Some things never change, LOL! @hello_rockview12 wrote: I see Steve is still the #1 snail fan on CA. Some things never change, LOL! Yeah, but the b"*(&^ds still eat my killie eggs. My dogged resentment of snails will never change. Watch out Steve. I think I know where Francois is going with this, and he is about to stand our prejudices on their heads. I won't give a spoiler because I have spoken to him about an experiment he's tried, but it is going to be surprising. It left me hating snails respectfully. There are so many snails, I do not know which one we should hate the most. I got a tank turning bad because a mystery snail died, so I decided to get rid of them. On the other hand, with close to 4000 species of gastropods, some snails are likely not all born the same. Most of them are scavengers and will eat dead matter (plant or animal) as well as algae and fungus like. Some will complement their diet with live plants, planaria, hydra or even other snails. Even worse for this post snails are believed to eat eggs. What do you think, how many eggs were still present when I went back home? Some hints? There were half the number of snails compared to that of eggs. Most of them were about the size of the medium sized on the first picture. Ellen E. Strong , Olivier Gargominy, Winston F. Ponder, Philippe Bouchet; Freshwater Animal Diversity Assessment Hydrobiologia January 2008, Volume 595, Issue 1, pp 149-166 Global diversity of gastropods (Gastropoda; Mollusca) in freshwater. @francois wrote: Some will complement their diet with live plants, planaria, hydra or even other snails. Have you identified any snail species that actively eats hydra and planaria? Please let me know; I'll be the first to try them out. Asolene spixi are believe to eat hydra as may do mystery snail (Asolene spixi are a kind of mystery snail). I do not have hydra and never have tested them. Anentome helena (assassin snail) eat planaria, I think the petshop near my place tested it once with success. Planorbus as on the picture above will not be good candidate as you will see when I will give you the answer of the question.!! All eggs survived the 4-5 days needed to hatch. These snails (I do not say that all snails will do but this kind of planorbus is) were going on the eggs and clearing off algae and fungus from those freshly spawn eggs. All these things are caviar for those snails.!! Why using snails instead of chemical anti fungus like Methylene blue or acriflavin? Because I came across one species of cory whose eggs were sensitive to chemicals and the eggs were not hatching. So I had to turn to helpers that will scavenge algae and not live eggs. I tetsted these planorbus snails and it works. It works no nicely that I do no longer use chemical and go straight with snails. So far I tested it (each time with success), on 3 corydoras species, 1 aspidoras, and tests are on the way for 2 killies (Rivulus cylindraceus AlCastro and Fundulopanchax gresensi Takwai) after 4 days the eggs are still arround with planorbus in the same container! I've personally moved to keeping a small collection of killies. I'd like to hear how this works with eggs that have to water incubate for 2-3 weeks. After a week killies eggs are still here and very clean. It will not be a statistically conclusive test as I have only 3 eggs of F.gresensi and I do not remember how much I put of R.cylindraceus but not much more. Those killies are young and or parents eat their own eggs before I have a chance to collect them. You may want to do your own test and repport on the forum. On the over hand if you provide me with 20ish eggs, I will happily test them in my setup, alternativelly I can provide you with some planorbus snails to do your own test. It is to early to see but those are Corydoras CW010 (orange laser cory)!! This was done in very bad condition for an egg as other the coruse of the experiment, incubation, I left unfertrilized eggs, plant and sand, but all fertile eggs did hatch and none get fungus.!! It was one test where I push to the limit of what is acceptable for eggs, to see if this way of doing was robust. I have found pond snails attached to lampeye and Aphyosemion eggs in my mops,and those eggs vanished. But maybe that was before the eggs had hardened. Hmmm. My untested observation is snails in the mops reduce harvests of eggs. I'll try here with my Aphyos and some of the snails pictured. Why not? I love being wrong when being right screws things up. Interesting observation. I thought all snails attack eggs. If ramshorns are special in acting as egg cleaners, then this may be a breakthrough in fish breeding. There I am, being willfully ignorant and not looking up snail species. No respect...I have seen them on good Aphyosemion eggs, and the egg has disappeared. I'll still pick some eggs and drop in a ramshorn anyway, as I'd like to test this. 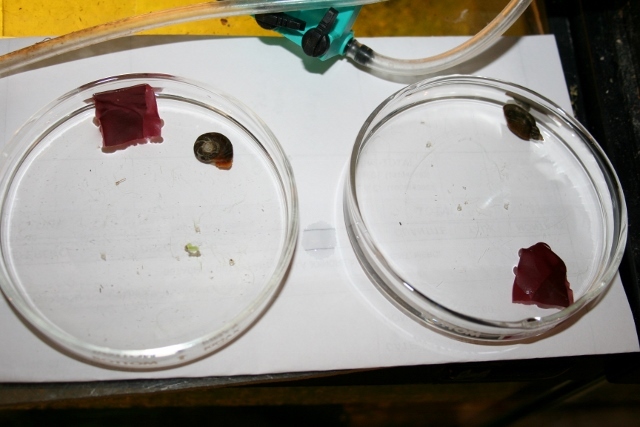 @GaryE it will be nice if you can test pond snail and ramshorn snail in parallel with the same number of eggs to see which one will take care of your Aphyosemion eggs the longer. I have tones of those ramshorn snail here so if you want some I could bring some to you at our next MAS meeting (where I will present this finding). I do it in small cups, change water every day, and only put one inch of water with no air line. 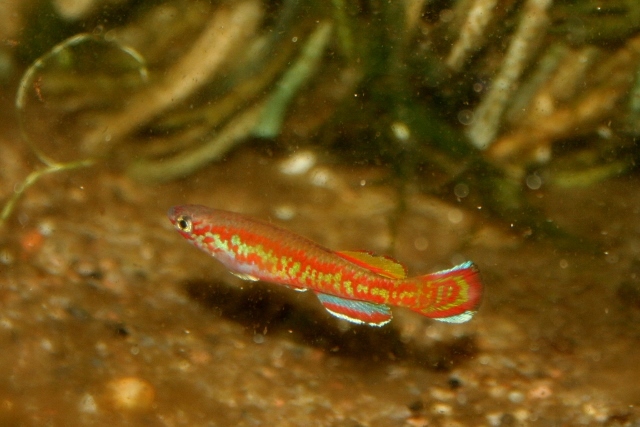 I collected 8 eggs from this fish, Aphyosemion exigoideum. I divided them into two petrie dishes, 4 each. Into each I put a small piece of dulse, a snail attractant seaweed (on the principle that if snails were starving they might go for eggs as a default). One dish got a common pond snail, and one a ramshorn. After 24 hours, the eggs are still there. So is a load of the usual snail crap. The dulse has just softened enough that the snails are starting to consider it. So so far, my prejudices against snails may be wrong. That's at 24 hours. Let's see as the eggs eye up and develop. I haven't seen glass petri dishes since the early 80's. Usually I find the thin plastic ones, but I think you have some novel technology there GaryE. Brings me back to the days of discovery. Interesting experiment and something to talk about even if the snails leave the eggs alone for 24h. Maybe dulse is the key ?? A "control" would be what you would normally expect. One petri dish with ramshorn/pond snail, eggs and no dulse. This would be the control observation, that without dulse, the snail eats eggs. This should be as expected, that the snails eat eggs. I know, but I didn't have enough eggs to make a control. The pond snail had hit the dulse, the ramshorn not. They had moved around the eggs, maybe playing basketball? The glass petries are from the school. The techs ordered in the plastic ones, which are safer for kids, and I intercepted them on their way to the garbage. Hey, old technology and school budgets - they go together. I love the old school petries. They have many uses. I would not worry to take out the dulse, just to know if pond snail will eat eggs, ramshorn should not harm any eggs. Why give vegetable to your snails when you want to test their taste for meat? Here only one rule: lick, graze, clean, or starve. It works: dark brown spots are now clearly visible inside the Fundulopanchax gresensi takwai eggs, while the 3 snails are sliding around. Actually to make things even worse for the snails and worth for the eggs, not only there is no snail food but water is changed daily. I pour off as much water as it is possible (usually well over 90%) and replace it with fresh aged one! 2 days later - one egg is gone from each tray, but the snails are in a small space with the others. If they were as bad as I thought, none would be there. I have seen ramshorns eating eggs though, on mops. Why they did that, but only one egg is gone here - interesting. Ramshorns poop more than pond snails, even if you change the water. Two new born Fundulopanchax gresensi "Takwai" and one to come out of its chorion. The other eggs were added more recently.